New York City! So Unique and So Much To Do! Welcome to New York Real Estate. Undertaking this huge project of trying to fit information about New York into one page is daunting and quite impossible! There is so much about New York that makes it unique. We will be discussing some of the history of New York, Apartments in Manhattan, demographics, weather, historical aspects, fun landmarks, and wonderfully distinct communities such as Manhattan Apartments and the Upper West Side Condos & Coops within New York Real Estate. New York City was voted the world´s Most Polite People by the Readers Digest , 2006. I know this may surprise some of you, but it shouldn't. New Yorkers have been through a tremendous amount and survived! We are a thankful and gracious sort and welcome all visitors to this great state. 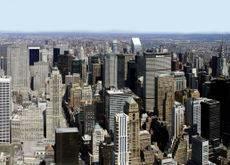 New York´s real estate market offers a wide variety of New York housing opportunities. There are over 8 million people residing in New York. New York Real Estate can be a great investment! The housing industry includes single family homes, trendy condominiums and townhomes co-ops and apartments. Even large ranch style homes and perfect apartments in the Manhattan Real Estate area. You can find 18th and 19th century mansions restored to their magnificent original decor. The historical charm in Manhattan alone is endless. Although there is much debate about why New York is called the Big Apple, it appears it was first used in print by John Fitzgerald, an early feature writer for the Morning Telegraph newspaper back in the 1930´s. Others say it was the jazz scene in the early 1930´s and 40´s that brought the name about. On West 135th Street and Seventh Avenue in Harlem, there was a popular night club named "Big Apple" as well as a jitterbug type of dance group that swept across the south and into Harlem. Who ever started the term The Big Apple, doesn't matter as much as throughout the world people know this phrase and associate it with New York. New York was once the capital of our nation from 1789 to 1790. 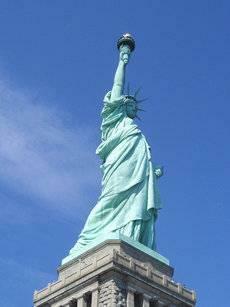 It took nine years to sculpt the Statue of Liberty It was a gift from the French. She has a size 879 sandal! They have one in France also. Did you know Babe Ruth hit the first home run in Yankee Stadium at the first game ever played there in 1923? New York State Unified Court System has an excellent website if you´re interested in how the system works in the state of New York They have documents relating to anything from criminal law to facts about the judges in the state. The Empire State takes great pride in having a New York education and generously invests in the more than 4,000 public schools as well as the over 2,150 private schools. 80% of the high school students that graduate seek secondary education. Now that is something to be proud of. New York City's Historical Charm is Endless! While July is generally the warmest month in New York it is also the month with the most precipitation. On average in 2009 they had 4.5 inches of rain in July! High Manhattan temperatures reach 85 degrees, but you know that comes along with humidity. Well that covers just a very small amount of New York! Check back often, I will add more information. If I have peeked your interest and you would like to find out more about the Real Estate investments and homes available in New York, please email me, I would love the opportunity to allow you to experience ownership! Review other pages on my website to find out more about community, schools, and individual Manhattan cities in New York Real Estate and the Manhattan Apartments area.